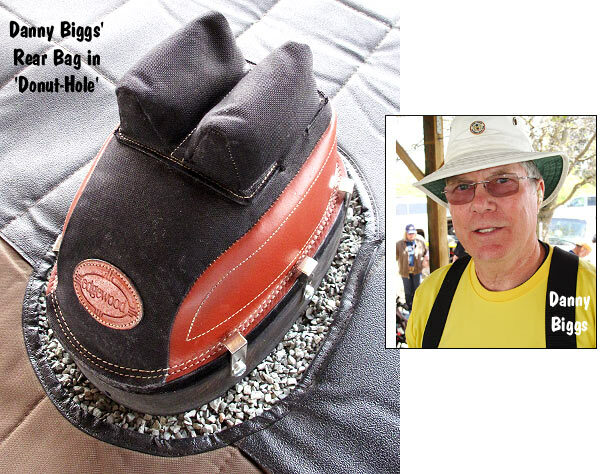 Danny Biggs is one of the nation’s most successful F-Class shooters. A two-time (back to back) National Champion in F-TR Class, Danny finished third in Open Class at the recent 2010 National Championships in Sacramento, CA. Notably, Danny’s X-count of 67Xs, the highest of all competitors, was 10 Xs higher than 2010 F-Open winner Derek Rogers. Danny is a very savvy competitor, to say the least, and he brought some innovative gear with him to the Nationals. Along with his prototype height-adjustable Sinclair wide-base bipod, Danny used a cleverly modified shooting pad and Edgewood rear sandbag. 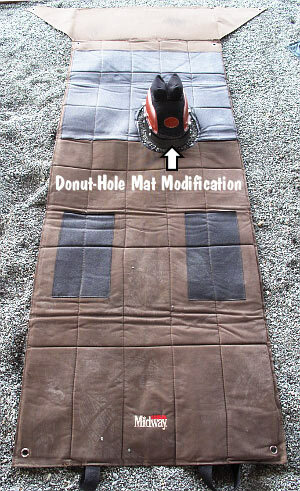 Danny’s “donut-hole” mat featured a cut-out in the middle, allowing him to place his rear sandbag directly on the ground. This helps stabilize the bag no matter what the ground surface or slope. With the bag sitting directly on the ground, it’s less likely to slide or rotate. Danny did not employ an expensive shooting mat. 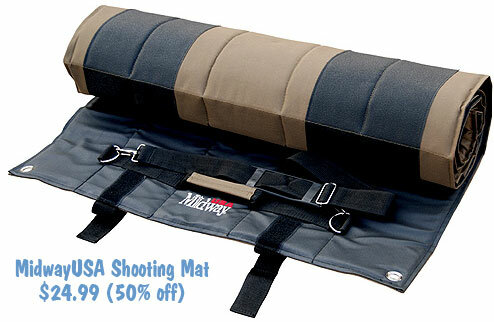 He was using the same basic MidwayUSA shooting pad that’s on sale right now for just $24.99 (sale ends May 31, 2010). Sized 69? Long x 27? Wide, this mat rolls up into a 6-7? diameter “sausage” for transport or storage. The mat has rubberized elbow and knee pads; the mat is about .325? thick at the elbow pads and .350? thick at the knee pads. Grommets on the corners allow the mat to be staked down in high winds. The bottom has a non-skid texture so it doesn’t slide around, and the mat comes with both a carry handle and a shoulder strap.